Photos by Toni Siebert, Lindcove, Ca, 12/13/2007. Photo rights. Source: Received as budwood from HortResearch, Kerikeri Field Station, Northland, New Zealand, 2006. HortResearch website: " 'Bay Gold'... was the first citrus cultivar to be registered for Plant Variety Rights in New Zealand." Released: 1993. Our citrus breeding programme was established in the 1970s in Te Puke and was transferred to Kerikeri in the 1980s. The objectives of the programme are to produce easy-peel, seedless mandarins and scab-resistant lemons adapted to the New Zealand environment. We are using a range of conventional breeding methods to develop breeding lines and cultivars. We have recently released four cultivars for the home garden labelled the 'Bay' series ('Bay Zest', 'Bay Sunset', 'Bay Sweetie' and 'Bay Gold'). The Bay series is named after the major citrus growing regions of New Zealand (Bay of Islands, Bay of Plenty and Poverty Bay) and the cultivars are sure to be an attractive and flavoursome addition to the home garden." 1994, Muggleston and Glucina: Citrus are being bred for convenience factors such as an easy-peel skin, and adaptation to New Zealand's cool, maritime climate. 'Bay Gold', a Clementine mandarin x Seminole tangelo hybrid, is the first registered citrus hybrid to be bred in New Zealand. It is a juicy tangelo-like fruit that peels easily and is virtually seedless. It is also resistant to Alternaria, a serious rind blemish disease which affects the 'Seminole' tangelo." 9/3/2007, A. Currie: Bay Gold has been released in New Zealand as a home garden variety. It is an attractive tree and fruit but there are some issues that make it unsuitable for commercial production in New Zealand. 9/2007, RRK: 'Bay Gold' was sent to California with the restriction that only six propagations be made in order to observe fruit quality under California conditions. Therefore, it may not be distributed from the Repository and requests for propagative material should be sent to HortResearch. Availability: No longer commercially available in California. This accession no longer has an approved budsource. Please refer to the CCPP for information on another approved budsource or to start a reintroduction inquiry. 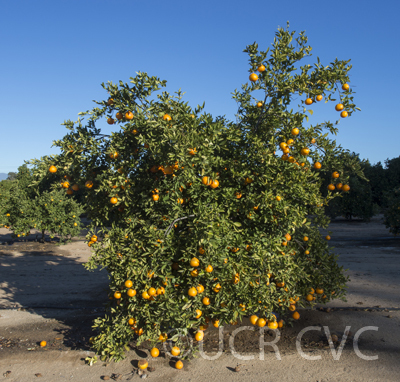 Restricted availability in California through the Citrus Clonal Protection Program.